If you wait long enough, everything comes back in style! 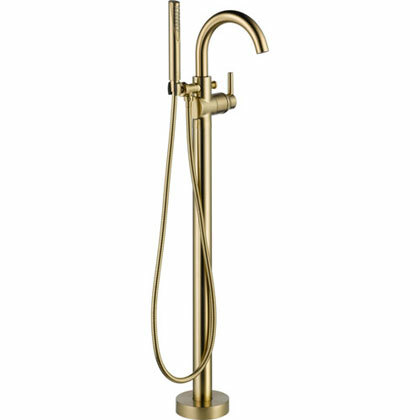 Gold fixtures are the latest trend in luxury bathrooms and kitchens, but with a modern twist. No longer are we stuck with the boring, old polished brass! The jewel of yesteryear no longer shines as bright, and this finish from the past has now been updated with more designer and decorative shades and textures, each with their own descriptive name. We see new fixtures in finishes like Champagne Bronze, Brushed Gold, and Satin Bronze popping up from all of the top manufacturers these days! 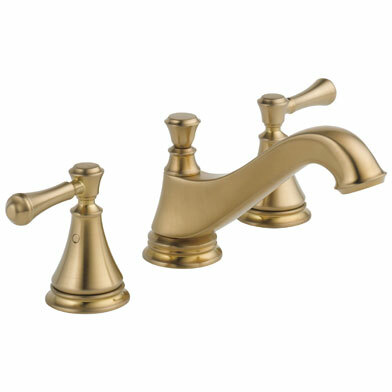 Champagne bronze and Brushed Gold fixtures are ushering in a new "Golden Age" in home decor. In the image of the beautiful modern bathroom above, you really get a sense of just how amazing new Champagne Bronze finish fixtures can look! 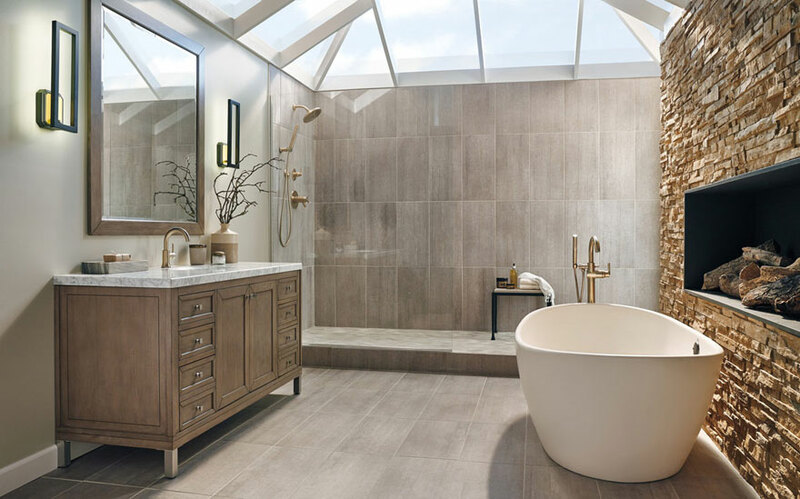 From the freestanding tub faucet, to the full custom shower system, to the single hole sink faucet, this room offers a tasteful design aesthetic with a super contemporary feel. Along with a huge soaking tub, a giant ceiling skylight, and a beautiful natural stone wall with fireplace, who would ever want to leave!? Serene luxury saturates every part of this design. Champagne Bronze is In, Polished Brass is Out! Compare the modern bathroom above with new Champagne Bronze finish fixtures to the polished brass fixtures used in the bathroom below. The difference is striking. The old fashioned polished brass fixtures overwhelm the room and are almost abrasive to the eye. It feels like you've entered a time warp to a 1980's Las Vegas suite or an oil baron's palace. 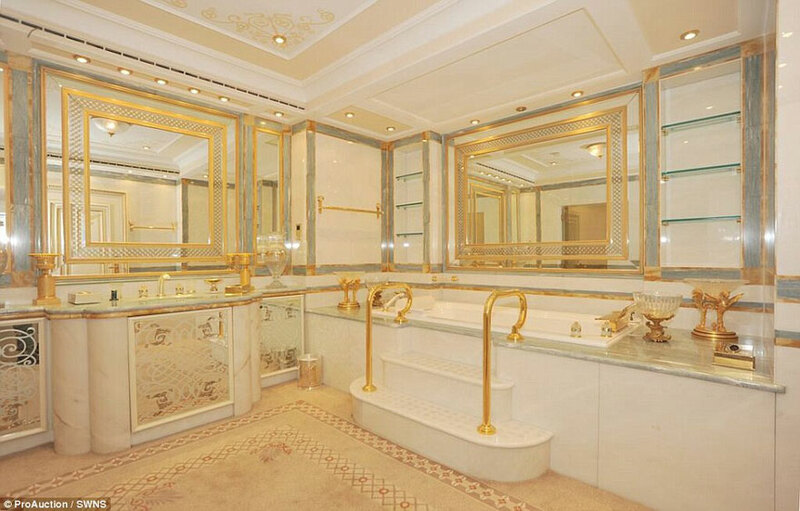 In fact, this image is a bathroom in a £300million super-mansion being sold by a Saudi prince in London. Sure it looks opulent, but is it tasteful? Words like gaudy and ostentatious come to mind. The polished brass in this image really overtakes the room...and not in a good way. The modern Brushed Gold finishes show that designers and manufacturers have really come a long way! Older Polished Brass finishes are typically found only in more traditional designs. The newer gold finishes, like Champagne Bronze and Brushed Gold, are made to be more versatile. Designers use these new Brushed Gold finishes to create modern contemporary rooms as well as to recreate an updated version of a classic traditional style. The updated gold bathroom and kitchen finishes are even versatile enough to be used alongside different metal finishes! We often see designers pair finishes like Champagne Bronze and Matte Black in the same space to create an eclectic modern design. 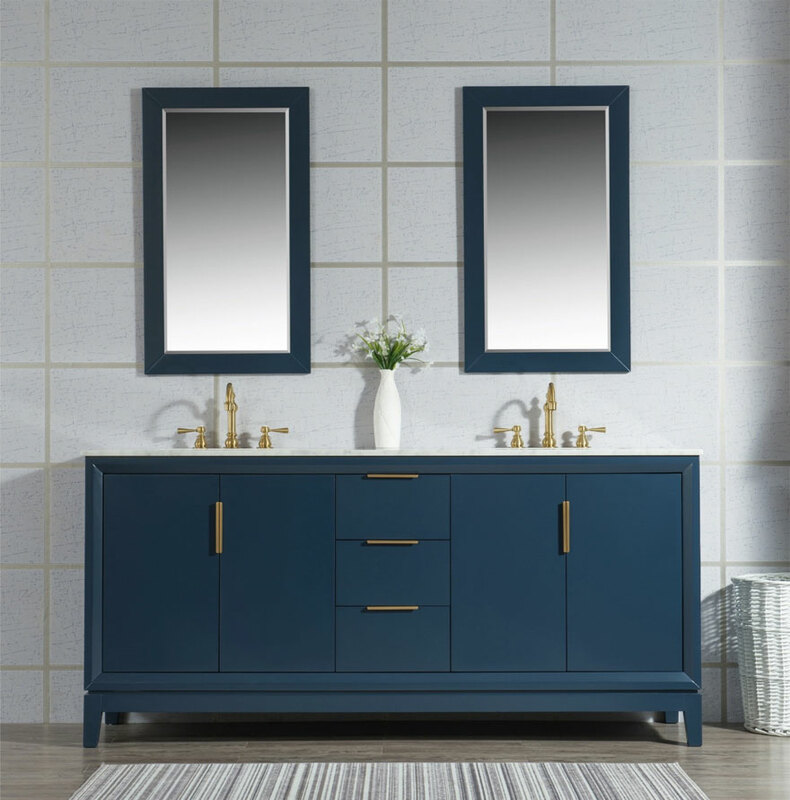 We’ve written this article to highlight our top choices for incorporating this hot trend into your bathroom and kitchen design in 2019. We will discuss the different words manufacturers are using to describe their gold finishes, and help you decide which finish will be best for your space! This article features many amazing images of bathroom and kitchens that utilize Brushed Gold and Champagne Bronze fixtures to stunning effect. 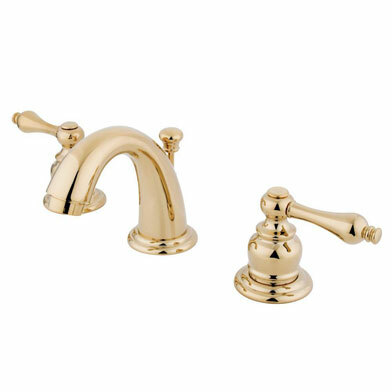 To get a better idea of how modern gold finishes compare to both each other and to polished brass, here's a side by side look at a few similar bathroom sink faucets. These images help to highlight the difference between the finishes made by different manufacturers. Typically, as with most designer finishes, you should try to stick with one brand as much as possible if you want things to match perfectly. However, as mentioned before, modern golds do work well when paired with other finishes like matte black so that's something to consider. 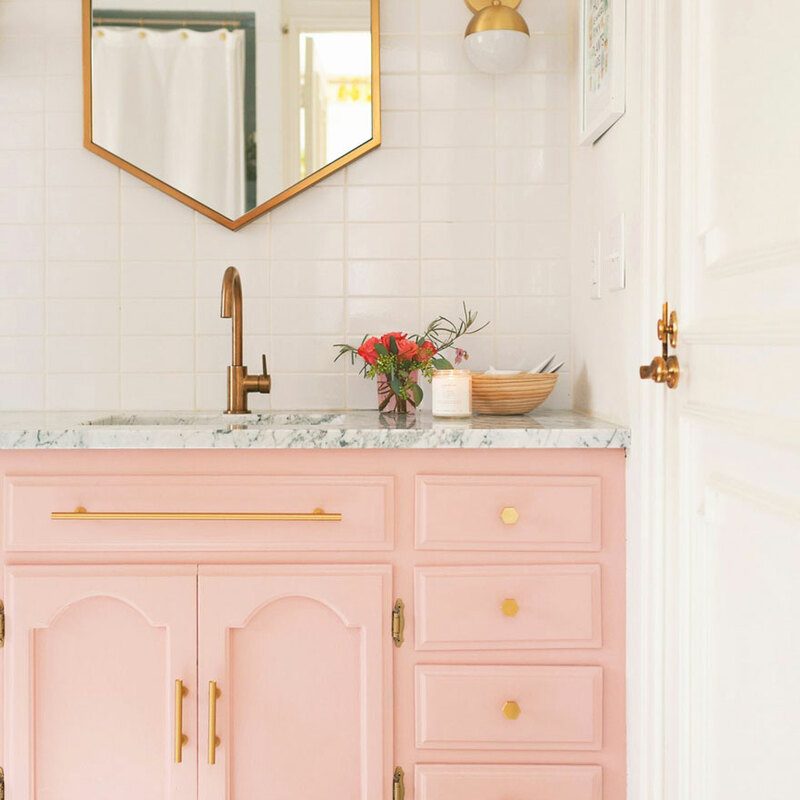 I used to avoid the gold spectrum when choosing fixtures and accessories for around the home because when I thought of gold, I always pictured the outdated shiny polished brass. That was before I discovered the many different new gold finishes that are now on the market! 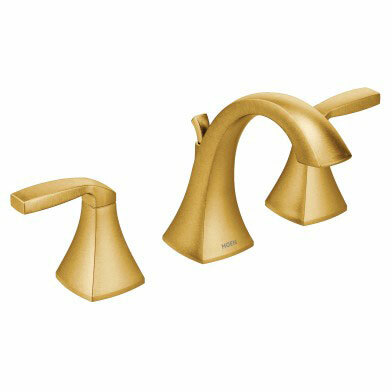 A modern gold finish faucet adds a touch of luxury to almost any bathroom design. 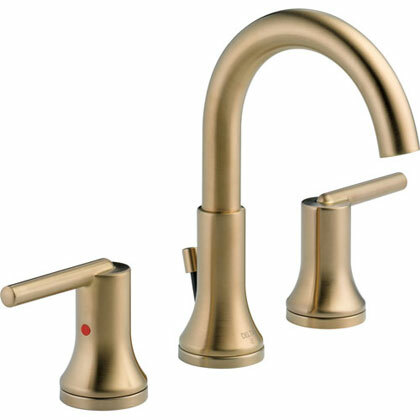 My favorite gold bathroom faucet finish is Champagne Bronze by Delta Faucets. The matte finish of Champagne Bronze looks modern, and is more spot resistant than other shiny finishes. This finish complements nearly any bathroom color scheme. You are more likely to see this finish in higher end bathroom designs. 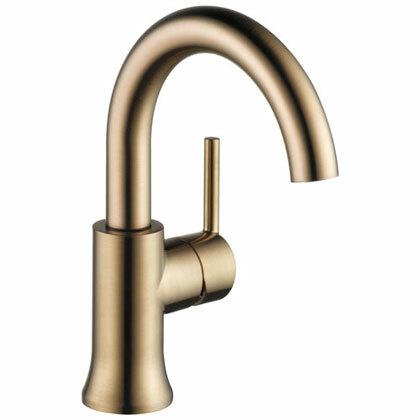 If you are looking for a another modern gold design option, a Brushed Gold bathroom sink faucet may be the choice for you. 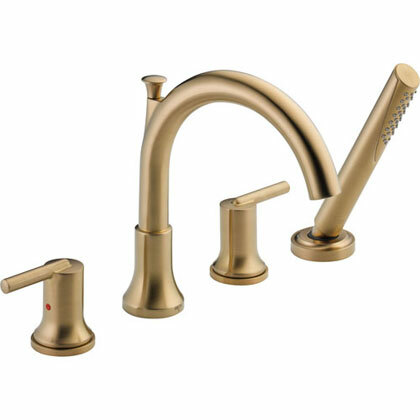 Brushed Gold, like the Moen Brushed Gold bath faucet pictured above, is a slightly softer and more muted tone that still hints at a traditional gold finish. Nothing feels more luxurious than a Brushed Gold bath faucet with a white marble countertop. But if you really want to get creative, maybe even consider pairing it with a black counter! Polished Brass was a created as a premium finish and was much more expensive than other finishes. Originally it was brass metal, literally polished to make it shine. 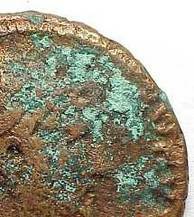 As a living finish, Polished Brass would age and was prone to getting what is known as bronze disease. This occurs when chlorides come in contact with bronze or brass finished fixtures, resulting in green fuzzy looking spots throughout the fixture. If left untreated, the entire fixture could be taken over. This bronze disease could be stopped however, but it required the fairly labor intensive task of cleaning and re-polishing the fixture often. 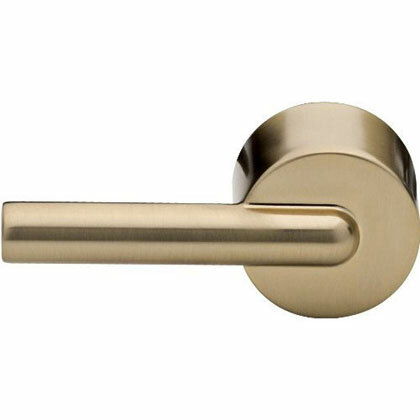 Up until the late 80's polished brass was a premium finish which required significant upkeep. More recently, newer finishing techniques like Physical Vapor Deposition (PVD) have been developed and have largely replaced the old methods. The new techniques coat the fixture in a way that protects it from corrosion. They also dramatically increase the life and durability of the finish itself. With these techniques, manufacturers have been able to create new finishes, like Antique Brass, or Oil Rubbed Bronze which replicate the look of aged Polished Brass, but without the risk of serious corrosion damage. 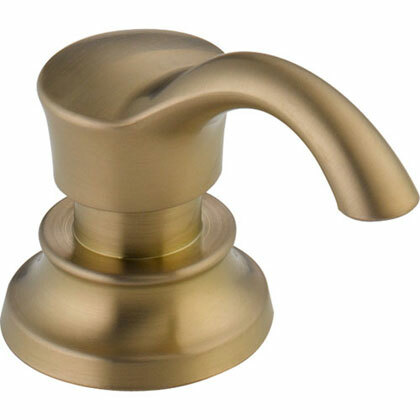 PVD coating also allows polished brass fixtures to maintain their bright shiny appearance without any special upkeep. 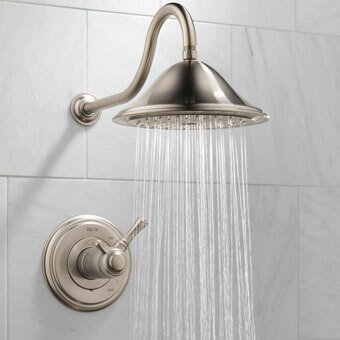 Using modern finishing techniques, manufacturers like Delta Faucet are now able to offer a lifetime warranty on not only the operation of their fixtures, but also on the finish! 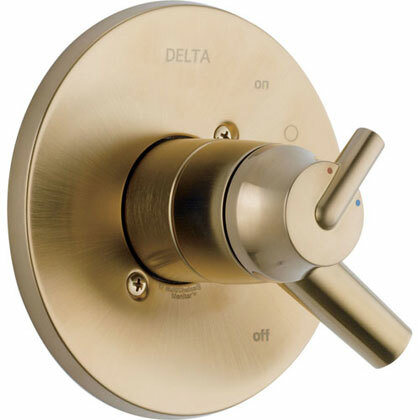 This makes Delta one of the best manufacturers of gold and Champagne Bronze plumbing fixtures. 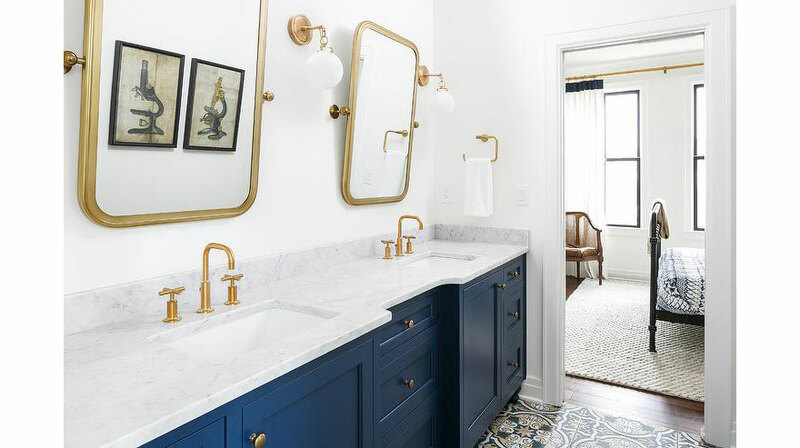 The gold finish wall mount sink faucet is the star of this bathroom but the Brushed Gold bathroom accessories add little touches of luxury throughout the space. 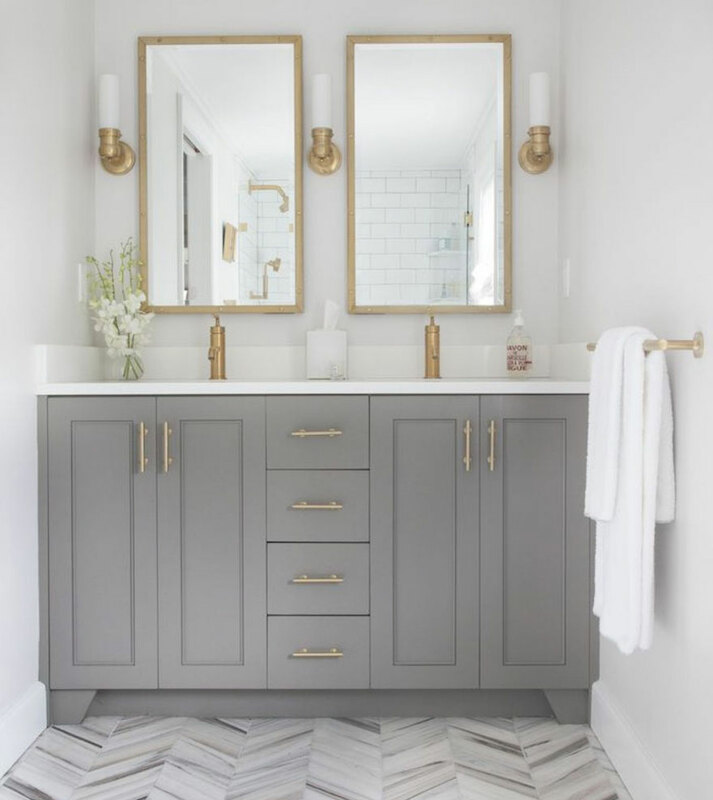 Whether you install gold bathroom faucets, or decide to go with a different finish, Brushed Gold accessories complement nearly any bathroom fixture. In this room you can see how beautifully different colors and textures can work with gold fixtures. 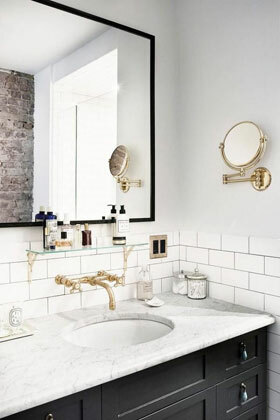 The gold colored faucet, the Brushed Gold mirror, and the gold glass bathroom shelves look great with the black power outlets, the pewter teardrop cabinet handles, and the black bathroom vanity cabinet. This is a fantastic example of how great gold and black look together in the same space. 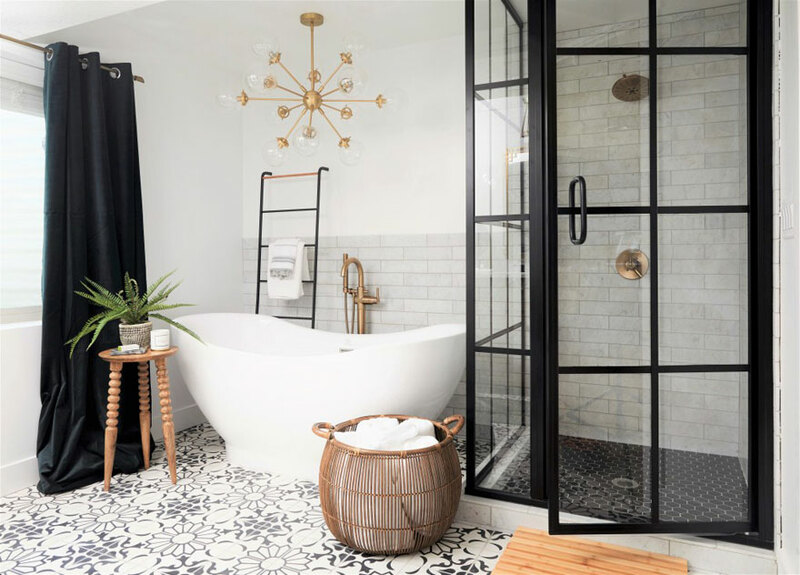 I personally love the black and gold fixture combination in a smaller bathroom space. The combination of black cabinets and gold bathroom fixtures in a mostly white bathroom opens up the space and adds a subtle upscale feel. 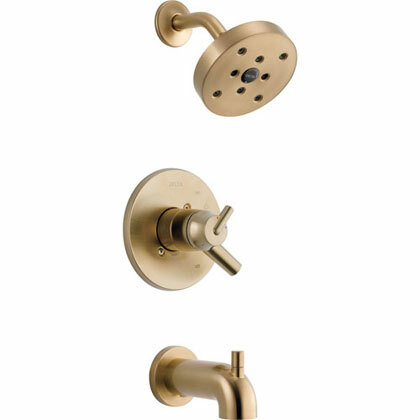 When shopping for Brushed Gold fixtures for your bathroom take a look at what Delta has to offer! 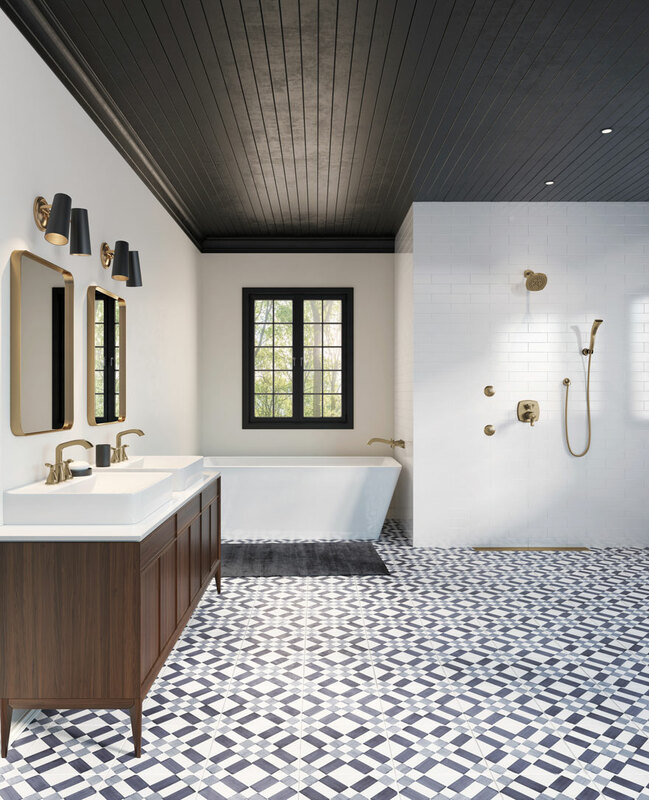 Not only do all their products come with a lifetime warranty on both parts and finish, the Delta Trinsic Collection offers a comprehensive set of Champagne Bronze finish products perfect for creating the luxury master bathroom design of your dreams. A bathroom design is not complete without matching accessories. Let's say you decided to go with the Delta Trinsic Champagne Bronze plumbing fixtures above, now you need to outfit the rest of the room with the proper accessories to make it truly functional. 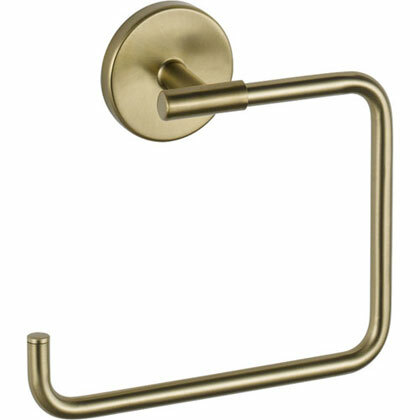 This Champagne Bronze toilet paper holder and towel bar would look great mounted on a light grey or white wall for a modern look. 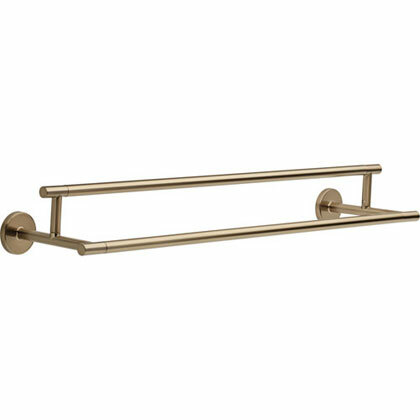 Unlike the outdated Polished Brass bathroom fixture accessories, these new gold finishes are soft on the eye so it is easier to install many accessory pieces throughout the room while still maintaining visual appeal. 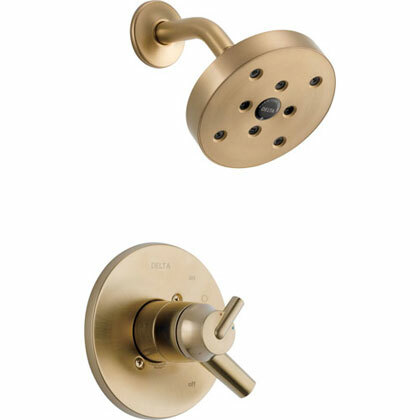 Delta offers a full suite of Champagne Bronze Bathroom Accessories. Check out their toilet tank levers, hand towel rings, double towel bars, single towel bars, toilet paper holders, robe hooks, and more! Finish off your bathroom design with these great looking, function fixtures! If you want something really special for your master bathroom, consider a Full Custom Champagne Bronze Shower System. Champagne Bronze is by far my favorite gold finish. This Delta Champagne Bronze shower system offers a rich luxurious appeal. Here we see Delta's Champagne Bronze finish used in a modern setting, but these gold shower fixtures are versatile enough to also look great in a contemporary or minimalist design too. 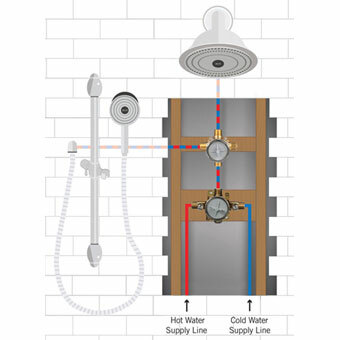 The Delta Trinsic Champagne Bronze Shower System with Dual Thermostatic Control Handle, Diverter, Showerhead, and Hand Shower SS17T2592CZ3 featured comes with a 3-setting diverter which allows you to turn on the hand shower only, the showerhead only, or both at the same time! 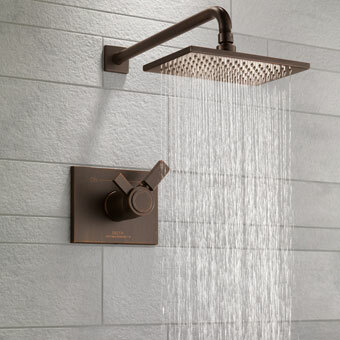 Champagne Bronze is a great finish for a shower system because it is more spot resistant than other popular finishes. Delta also offers a lifetime warranty on all of their fixtures which applies to both the product function and finish. This means you can always be sure of the quality. 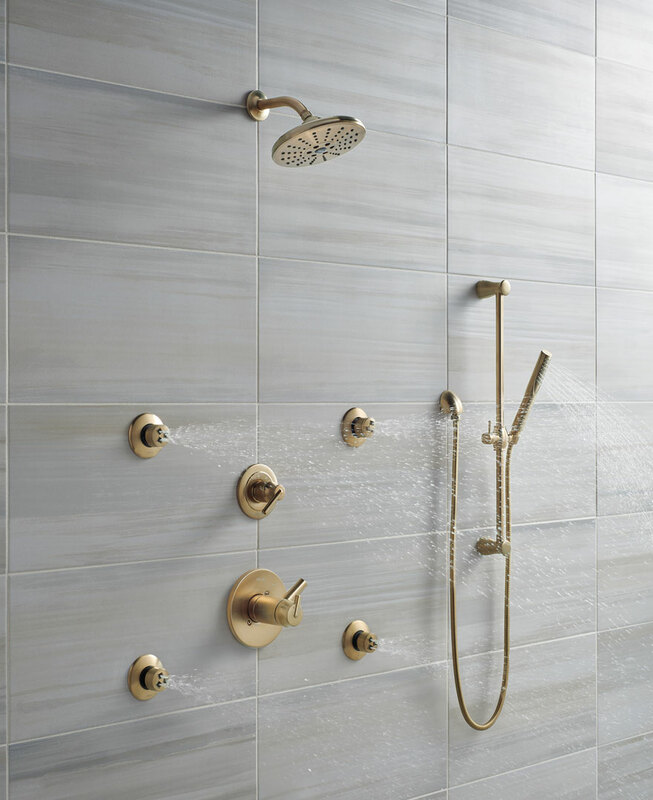 Splurge a little on your master bathroom and order an amazing Brushed Gold or Champagne Bronze custom shower system! This bathroom design seamlessly incorporates multiple fixture finishes to create a somewhat eclectic luxury bathroom design. Gold bathroom light fixtures of different types like this give your space an upscale feeling without committing to a specific design style. 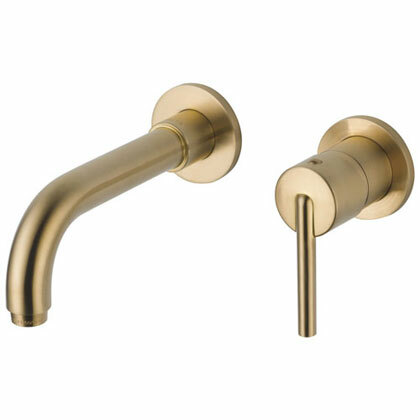 Like the picture above, modern gold finishes like Satin Brass or Champagne bronze can be used seemlessly with other finishes like Chrome Faucets and Matte Black door handles. Notice also how well the gold wall light fixtures look on the light grey-beige walls! The right light fixture can really complete a room. I mentioned earlier how well black and gold bathroom fixtures go together. 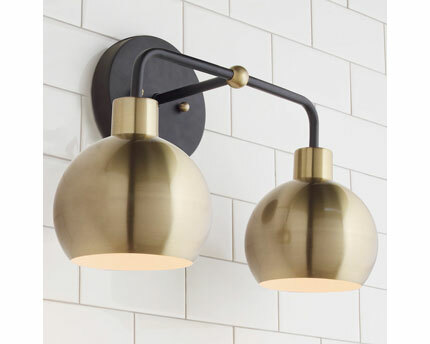 Take a look at this unique bathroom wall light fixture which combines the Brushed Gold and black in perfect harmony. This fixture looks extremely sharp against a white tiled wall. Design is where function and style meet and this light fixture truly exemplifies this idea. The newer gold spectrum finishes, like Brushed Gold, are much more versatile than the outdated Polished Brass finish and match well with other colors like matte black. Check out this bathroom (above) which is absolutely one of our favorite examples of a design that combines matte black and Champagne Bronze to great effect. Not only does the designer utilize a Champagne Bronze finish chandelier light fixture (that is stunning! 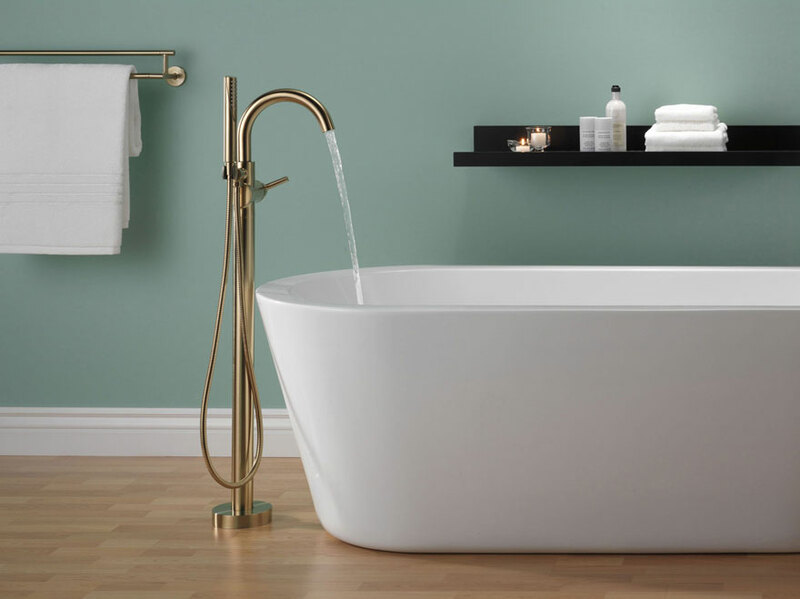 ), but they pair it with a Delta Champagne Bronze freestanding tub faucet and a beautiful white pedestal tub. 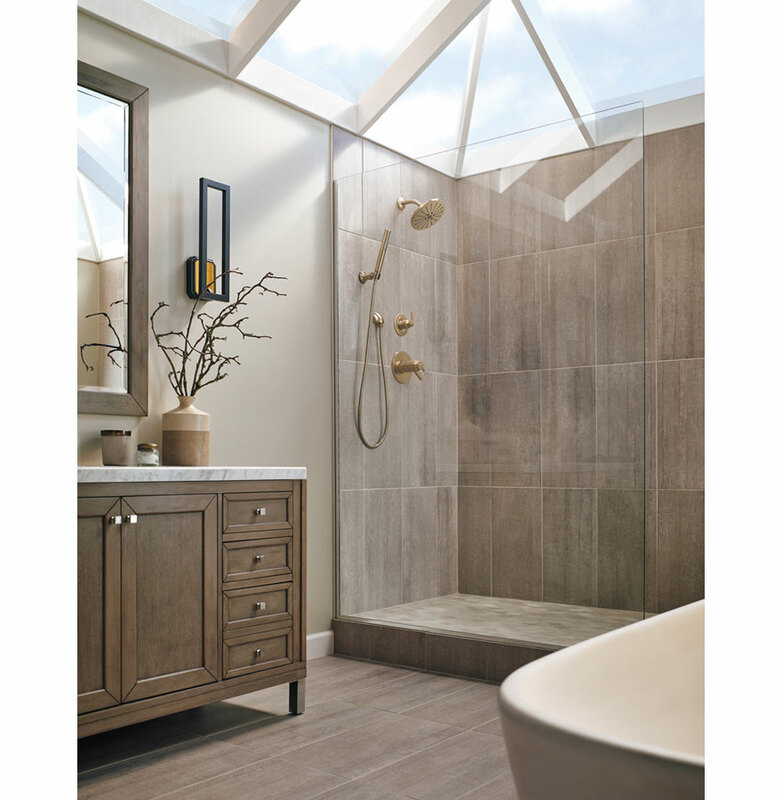 Get inspired by the black shower enclosure which looks great with a Champagne Bronze Shower Faucet. Really amazing! Source for this design: Andrea West Design. There are so many different fixtures that can be installed in a modern style kitchen. 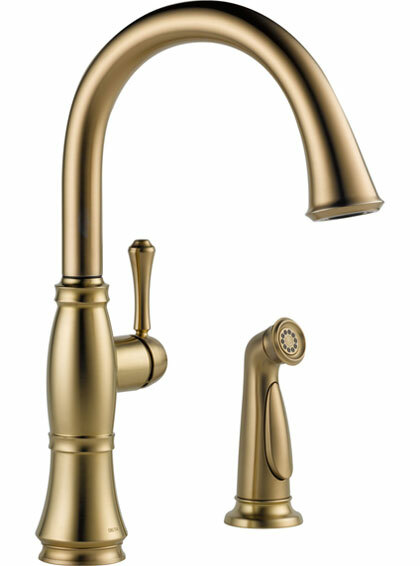 Delta Faucets has a great collection of Champagne Bronze kitchen fixtures, including kitchen sink faucets, bar sink faucets, pot fillers, and accessories. 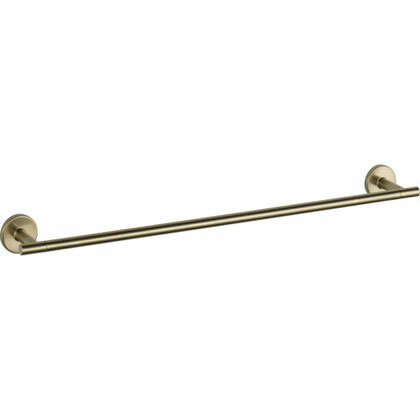 One of the coolest fixtures I have seen is a Wall Mounted Brushed Gold Pot Filler! Not only is it extremely useful when cooking with larger pots, a gold finish pot filler is a great way to add some richness to your kitchen design. 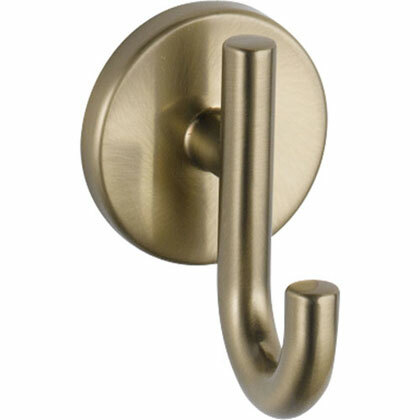 The old, outdated Polished Brass finish fixtures were somewhat difficult to pair with other appliance finishes. Champagne Bronze kitchen fixtures on the other hand are soft enough that they complement modern stainless steel ovens and refrigerators perfectly! They look super cool with black stainless steel appliances as well. In addition to looking great with stainless steel, Brushed Gold Kitchen Faucets look amazing with black cabinets. You could even try out a black sink or black backsplash! 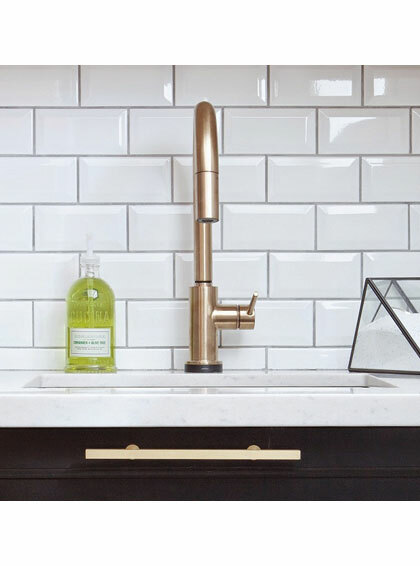 A Brushed Gold faucet, black cabinets, and a white backsplash will create a tasteful modern space. 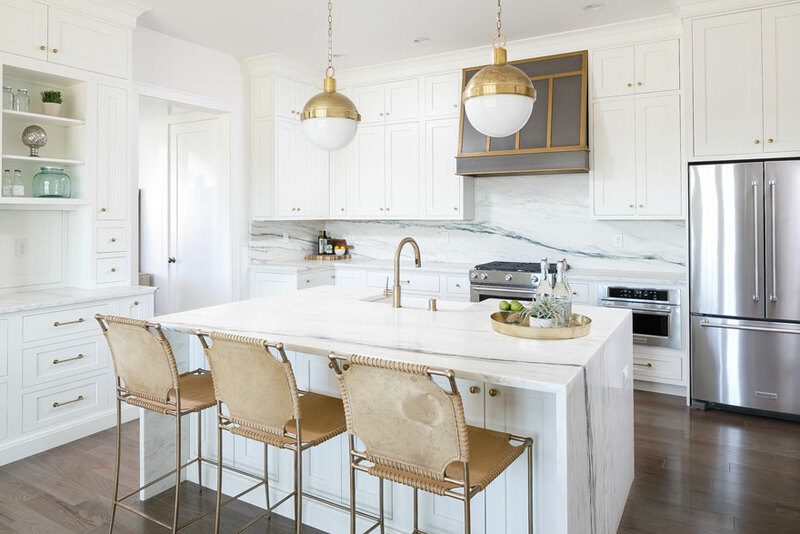 Because Brushed Gold finishes have a softer feeling to them they also pair well with cream colored countertops and white cabinets. Modern gold finishes really work well for a large range of styles. You can never go wrong in a luxury kitchen design with white. 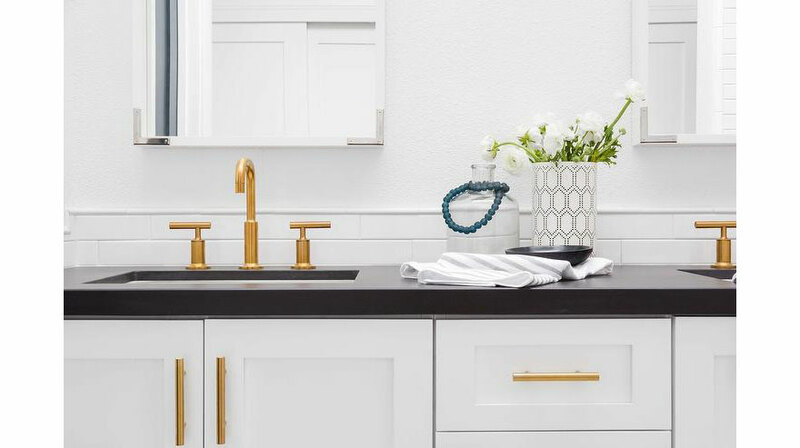 From the cabinets to the backsplash, this always popular style is taken to the next level when paired with a Brushed Gold kitchen faucet and cabinet hardware. I particularly love the idea of adding accessories such as a spatula holder to bring out and highlight different colors in a marble backsplash or countertop. 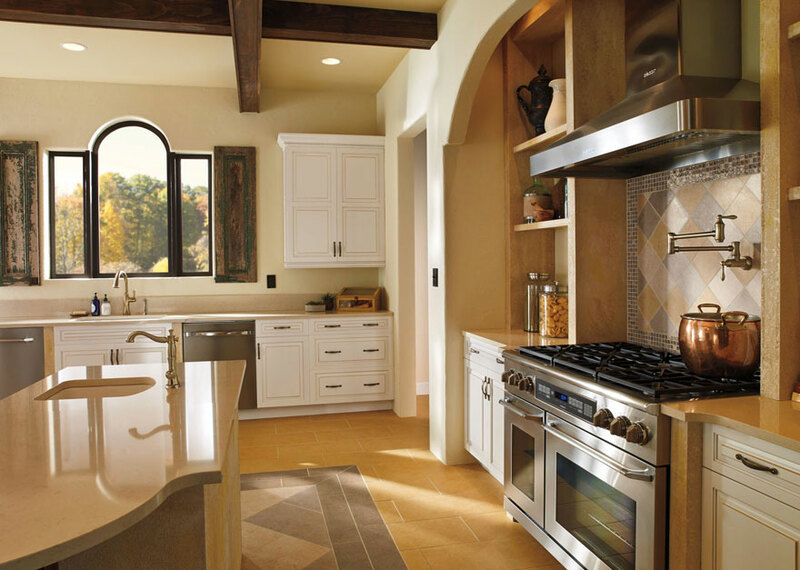 Designer finish Brushed Gold cabinet and drawer pulls can also help tie the entire kitchen design together. No kitchen design is complete without a matching soap dispenser! 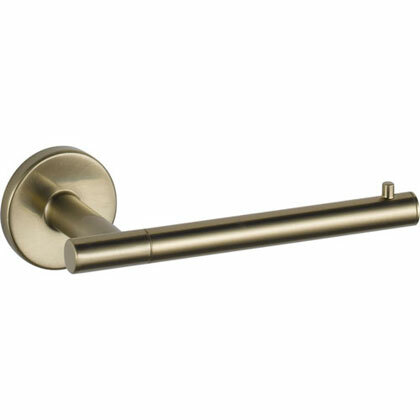 The Delta Cassidy kitchen collection has a great deck mounted soap dispenser in Champagne Bronze. Not only does a deck mounted soap dispenser add a touch of luxury to your kitchen design, it is also super eco friendly! Installing a soap dispenser allows you to simply refill it with your favorite soap rather than purchasing new disposable containers each time you run out. It also saves you the hassle of finding a disposable dispenser that matches your kitchen design. 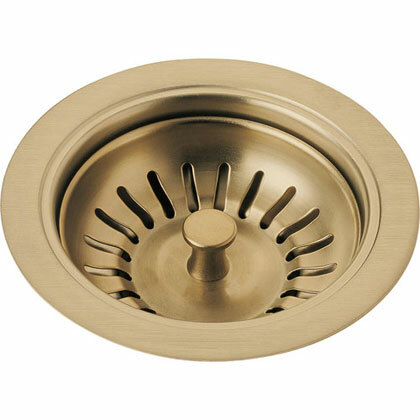 To match your soap dispenser and faucet, don't miss the other often overlooked details such as a Brushed Gold finish dishwasher air gap, kitchen sink basket strainer, kitchen sink garbage disposal flange and stopper, and maybe even a set of bar stools! Most modern kitchens have some kind of eat-in space. 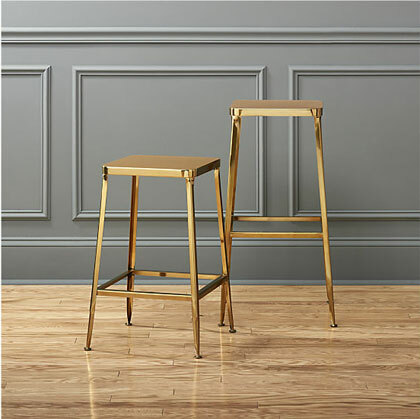 Incorporating a few Brushed Gold or Champagne Bronze bar stools really completes your kitchen design! Choose a bar seat that’s appropriate for the height of your counter. Notice how Champagne Bronze and fixtures in the kitchen pair great with non-traditional style cabinets, like olive green or grey, for a more modern eclectic design. 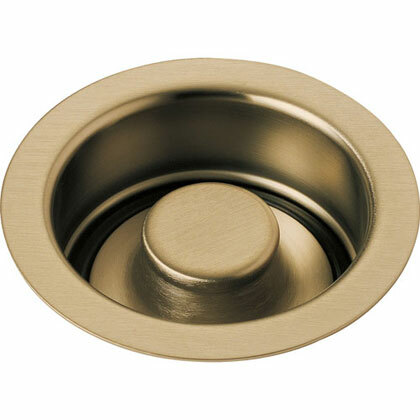 Other great gold kitchen accessory fixtures to consider including in your design are a countertop garbage disposal buttons, cabinet knobs, drawer pulls, refrigerator pulls, cabinet handles, etc. Finishing touches like this really make your design feel complete! A lot of older homes have outdated Polished Brass light fixtures throughout. Now you can update your light fixtures while still keeping the luxurious look of gold by using one of these new designer gold finishes. I love the pairing of a Brushed Gold chandelier against a darkly painted wall. 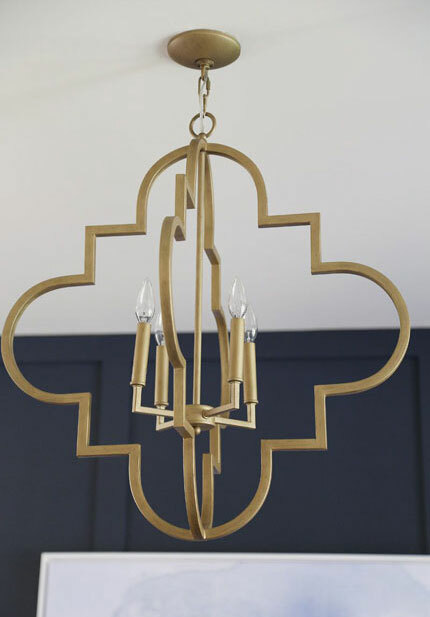 A fixture like this would look great in a dining room, above metal Brushed Gold chairs. This design is already rather modern, but the Brushed Gold finish gives it a somewhat classic and timeless feel. Adding a gold light fixture to your living or dining room easily adds elegance and luxury to the space. Nothing shines like a lit up gold light fixture! How great is this kitchen design? The designer completed the rustic modern look with antique gold light fixtures and gold cabinet pulls. 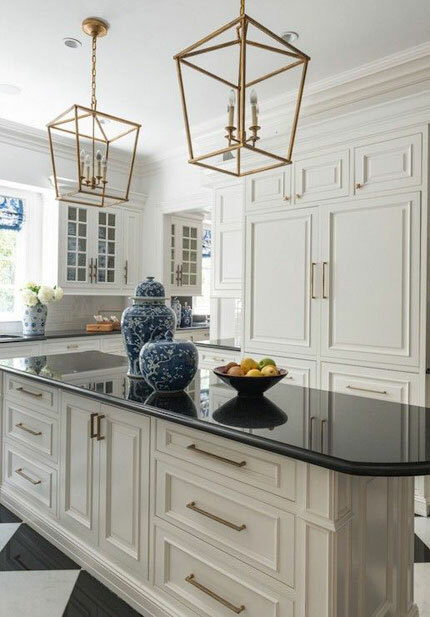 A black countertop and black and white floor tiles complement the gold light fixtures perfectly. 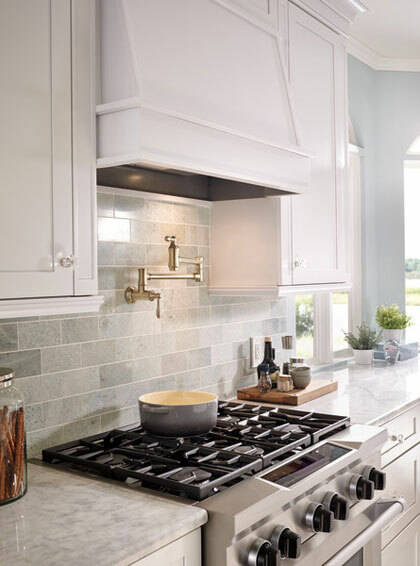 You do not typically see gold kitchen fixtures in a farmhouse style design, but I believe adding Brushed Gold or Satin Brass to a farmhouse kitchen is a great way to modernize the traditional style. 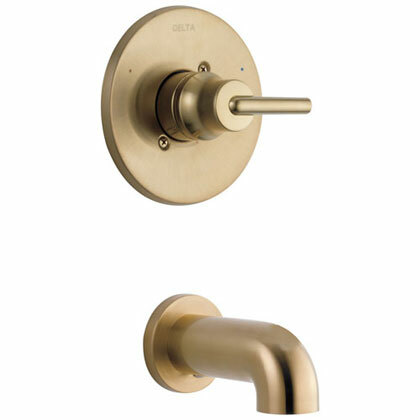 Here are some designs we like that make use of these modern Brushed Gold fixtures. 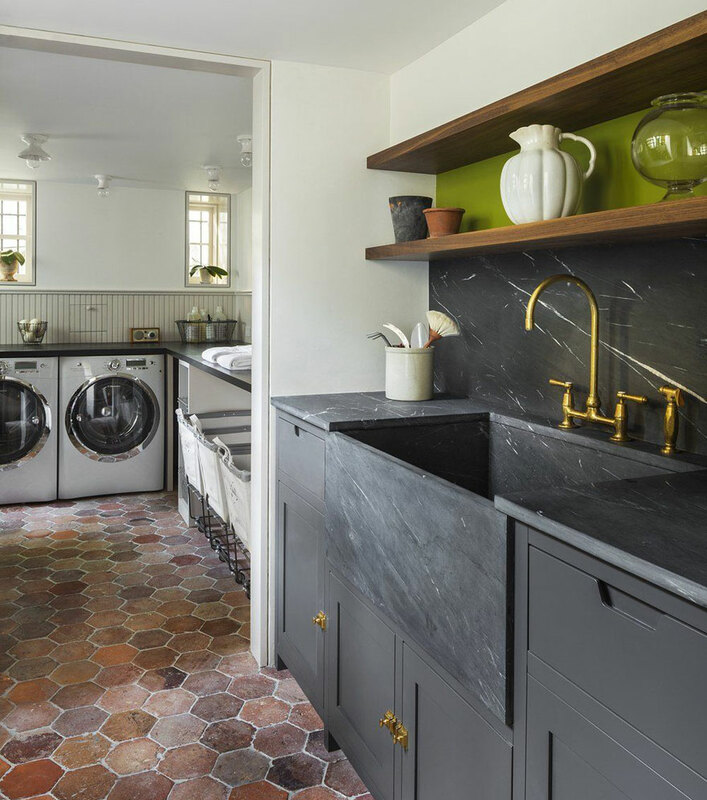 Whether you are remodeling your kitchen, bathroom, or both, there are so many ways you can incorporate this hot new trend in your home. Get inspired and start planning your new home decor now! From Champagne Bronze to Brushed Gold, these new modern gold finishes are incredibly versatile! As you can see, modern gold finished fixtures may be paired with nearly every accent color, in every design style. 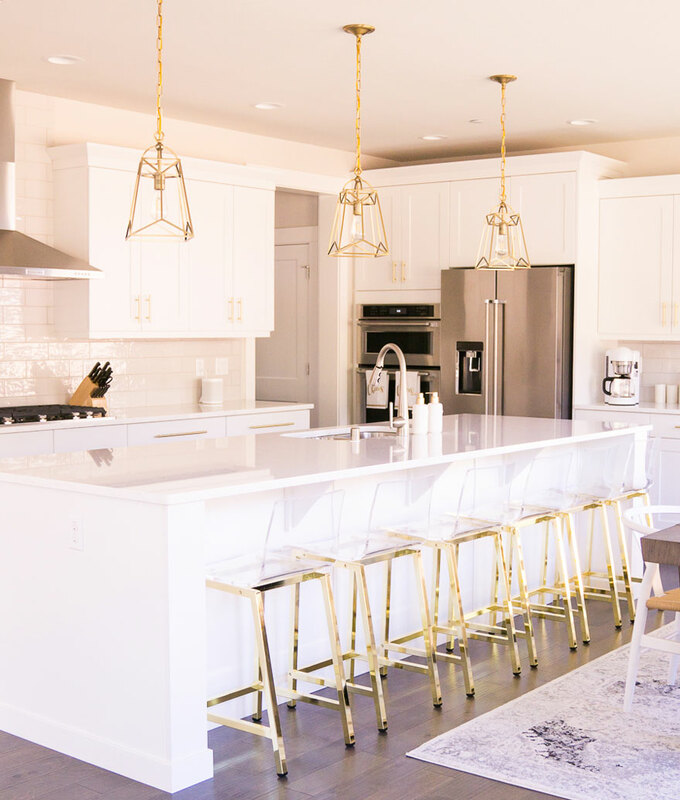 Bring in 2019 by adding a smooth new matte gold fixture to your next kitchen or bath design! Be sure to share these design ideas, and comment with a picture of how you incorporated these beautiful new finishes in your home! Please subscribe to our Newsletter for more design tips and ideas by entering your email address below the comments section. Thanks!